Featuring 44 inch lbs. of peak torque and a 21-position clutch with auto shut-off, the new M4 Hex Screwdriver Kit offers improved torque control during repetitive applications. Two speeds, 200 and 600 RPM, offer further user control for precision work. At only 244 millimetres in length and under one pound, the M4 Screwdriver is easy to use with one hand, featuring 1/4-inch quick-change chuck for one-handed bit changes. Drilling more than 200 holes per charge, the M4 Screwdriver is the first tool to feature Milwaukee's REDLITHIUM 2.0 battery on the new M4 platform, offering up to 50% more runtime. Milwaukee remains committed to offering innovative solutions in power, productivity, and portability. This Makita 4.8V screwdriver kit is an 80-piece bit set that's perfect for various light duty applications around the home or workplace. The screwdriver features an adjustable hinged handle with soft grip for maximum user comfort, and includes an integrated LED light that helps illuminate darker work spaces. One of the originators of auto feed technology, Muro has been a leader in the development of Auto Feed Screw Driving equipment and collated fasteners since they were first introduced in the mid 1980's. Muro has helped change the industry standard and currently offers the widest range of tools and fasteners on the market. Whatever the application - construction, manufacturing, or industrial, Muro has a coil or strip feed system to meet your needs. Muro continues to meet the challenges of today's demanding work environments and has a proven reputation for quality and performance throughout the industry. All Muro tools are backed by a complete one year warranty. 1/4 inch M4 Hex Screwdriver Kit Featuring 44 inch lbs. of peak torque and a 21-position clutch with auto shut-off, the new M4 Hex Screwdriver Kit offers improved torque control during repetitive applications. Two speeds, 200 and 600 RPM, offer further user control for precision work. At only 244 millimetres in length and under one pound, the M4 Screwdriver is easy to use with one hand, featuring 1/4-inch quick-change chuck for one-handed bit changes. 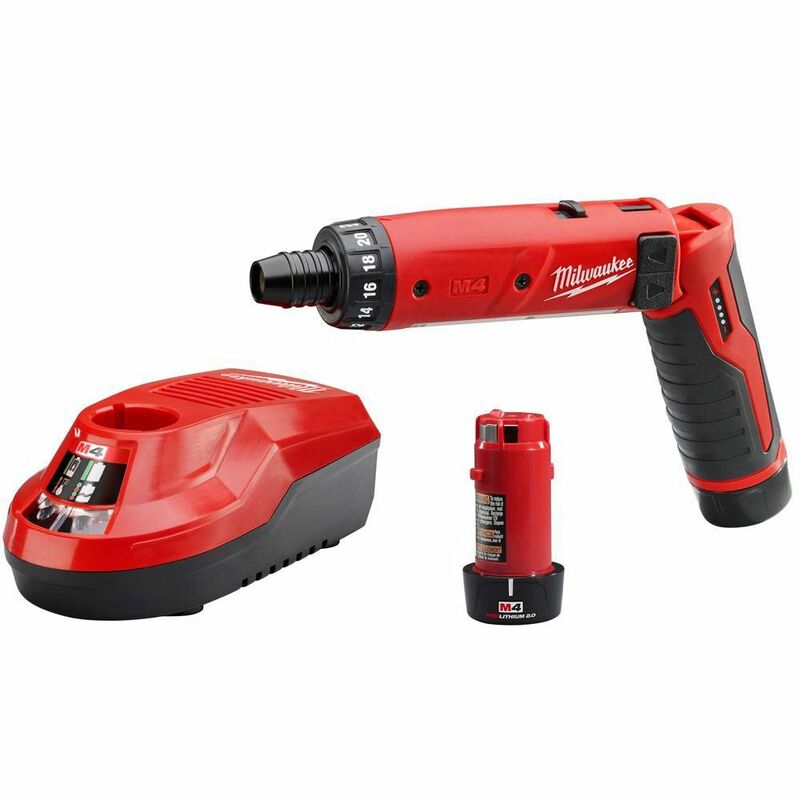 Drilling more than 200 holes per charge, the M4 Screwdriver is the first tool to feature Milwaukee's REDLITHIUM 2.0 battery on the new M4 platform, offering up to 50% more runtime. Milwaukee remains committed to offering innovative solutions in power, productivity, and portability. 1/4 inch M4 Hex Screwdriver Kit is rated 4.4 out of 5 by 146. Rated 5 out of 5 by Stephen from The drill is great, battery lasts a while even under... The drill is great, battery lasts a while even under high torque. Love it. Thanks! Rated 4 out of 5 by PeteTheBird from light weight, good torque control and battery life. The controls are awkward to use and when the ... light weight, good torque control and battery life. The controls are awkward to use and when the handle is in the bent position the tool is not usable in the left hand. Rated 5 out of 5 by RaisingArizona from I have a small business in my home and part of the assembly process requires attaching pieces wit... I have a small business in my home and part of the assembly process requires attaching pieces with small machine screws. I originally used a 4v cordless screwdriver by another manufacturer which had an adjustable clutch to prevent over torquing the screws. The problem with clutch is that once the torque is reached, the drill continues to turn and only if you apply a lot of pressure on the screw does the clutch actually slip ... making a loud ratcheting sound. Over time, the clutch wears out. With this other screwdriver, the reverse switch (which is mechanical) has given up and I can only position it to go in one direction. I was looking to replace this unit, however the manufacturer no longer makes a 4v model with an adjustable clutch. Fast forward to the Milwaukee 4v Cordless screwdriver. What a difference in quality. The forward / reverse switch is actually a toggle switch that appears to reverse the polarity of the motor. Much easier to select the direction. Instead of the clutch which ratchets once the torque is achieved, the Milwaukee screwdriver clutch has an auto shut-off feature. Much better control and no loud ratcheting sounds. And, for precision work, you can flip the handle to provide a pistol grip or a longitudinal grip. Excellent product. For precision work, this cordless screwdriver is absolutely the best product I have seen or used. Rated 1 out of 5 by Phil from Died after 2 weeks. Used it at work. ... Died after 2 weeks. Used it at work. I expected top quality. I returned it and went with the much less expensive ryobi.